The other day, we were sharing pictures from our trip with friends. 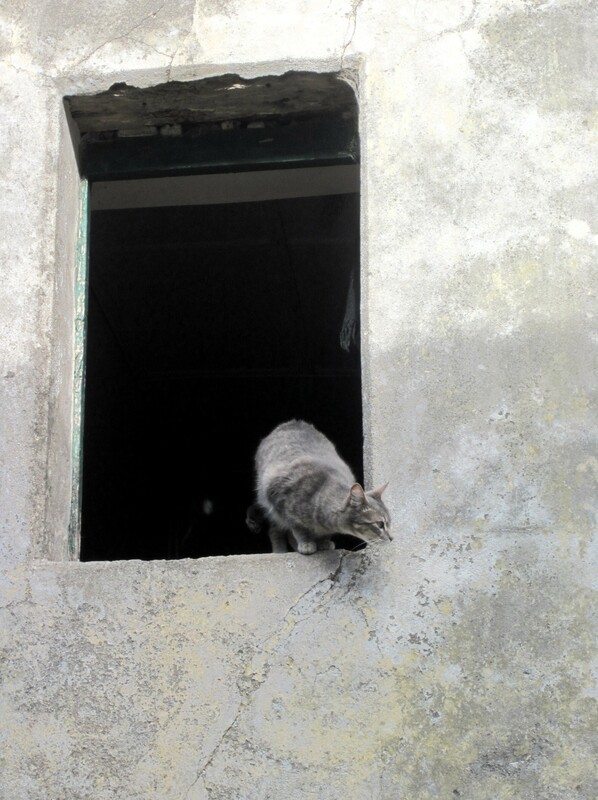 As we went down memory lane, we mentioned that during our travels, we saw a lot of cats in all sorts of different countries. 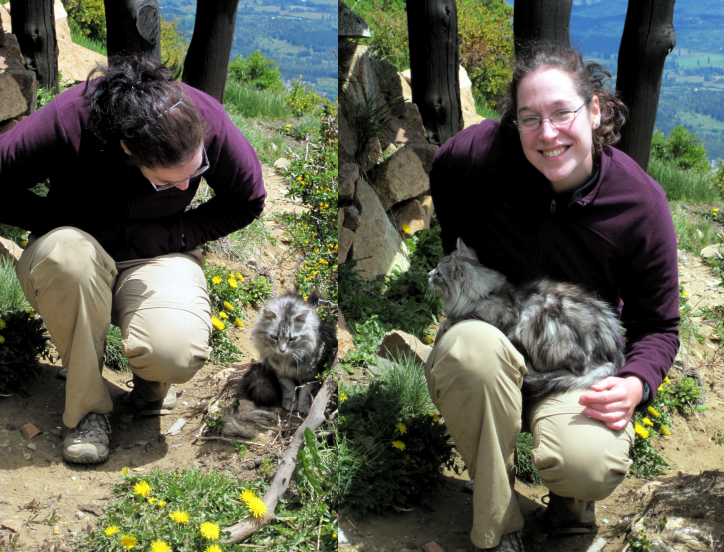 Being the cat fanatic that I am, I realized that I had never written about this. This was one of the greatest things on the road. 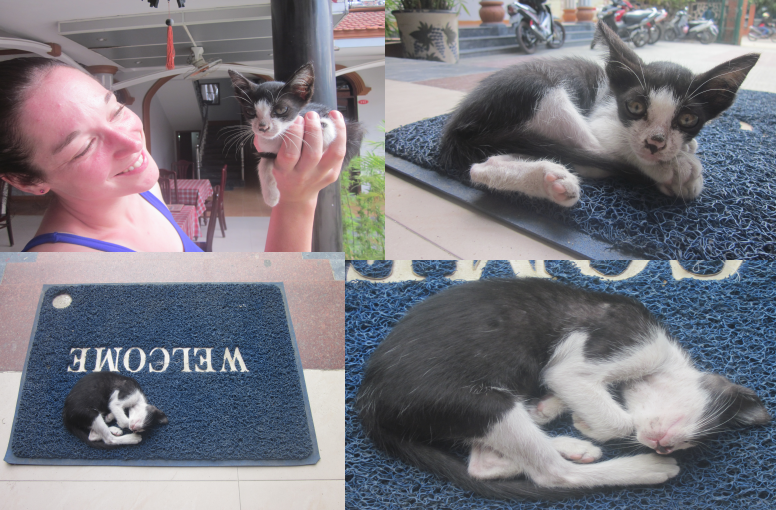 Especially in South America, we were joking around that the hostel description should really say “cat included”. So here, we go. Enjoy! Letztens haben wir Freunden Bilder von unserer Reise gezeigt. Als wir in unseren Erinnerungen schwelgten, kamen wir auch drauf, dass wir auf unserer Reise viele Katzen in allen möglichen Ländern gesehen haben. Mir als Katzenfanatikerin wurde dann bewusst, dass ich noch nie darüber geschrieben hatte. Die Katzen waren eins der besten Dinge unterwegs. Besonders in Südamerika machten wir Witze, dass in der Beschreibung eines Hostels eigentlich “Katze miteinbegriffen” stehen sollte. Also los. Viel Spaß! During a Patagonia hike in El Bolsón, Argentina. I have the tendency to talk to each cat I see. Most are very friendly. Während einer Wanderung in Patagonien. Ich tendiere dazu, mit jeder Katze, die ich sehe, zu reden. Die meisten sind sehr freundlich. Téo at the Altos del Sur Hostel in El Bolsón, Argentina. Téo loved the attention. Téo im Altos del Sur Hostel in El Bolsón, Argentinien. Téo hat die Aufmerksamkeit sehr gefallen. Rafa at the Refugio Lago Natación near El Bolsón. Rafa im Refugio Lago Natación in der Nähe von El Bolsón. At our hostel in Mendoza, Argentina. We called her “contemplative cat”. In unserem Hostel in Mendoza, Argentinien. Wir nannten sie “nachdenkliche Katze”. 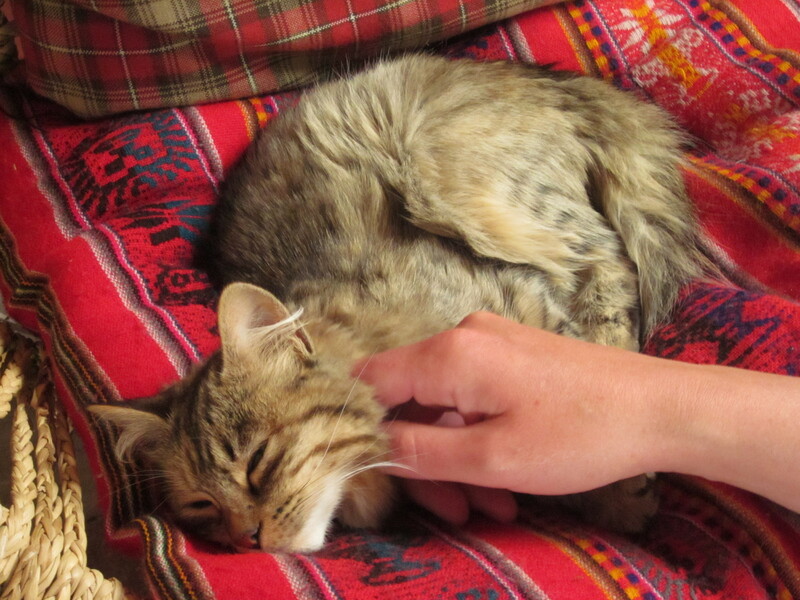 Cat included at the Los Andes Hostel in Arequipa, Peru. Katze im Los Andes Hostel in Arequipa, Peru miteinbegriffen. At the South American Explorers’ Club House in Cusco. You can tell we’re in Peru just by looking at the colorful blanket. 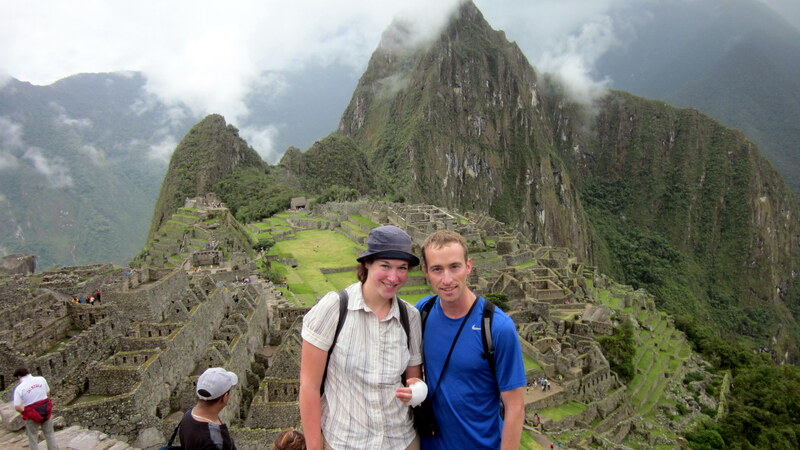 Im Clubhaus der South American Explorers in Cusco. Man erkennt schon an der farbenfrohen Decke, dass wir in Peru sind. Melissa’s Rohan and Baja in Somerville, MA during our 4-day layover in April 2011. 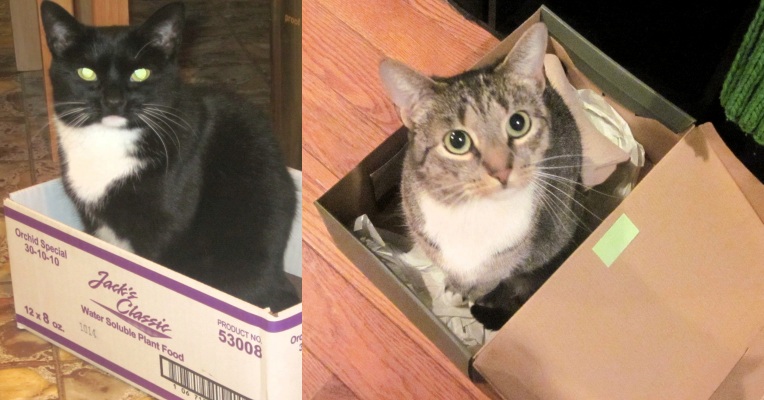 After 5 months in South and Central America, these cats looked rather fat to us even though Melissa claimed they had lost weight. Melissas Rohan und Baja in Somerville, MA während unseres viertägigen Aufenthalts im April 2011. 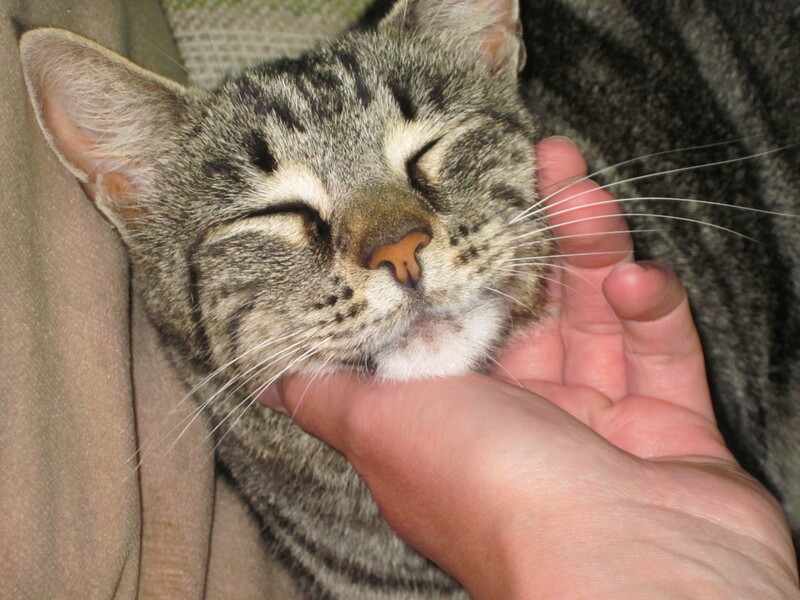 Nach 5 Monaten in Süd- und Zentralamerika sahen diese Katzen eher fett aus, obwohl Melissa behauptete, sie hätten abgenommen. Hoi An, Vietnam. 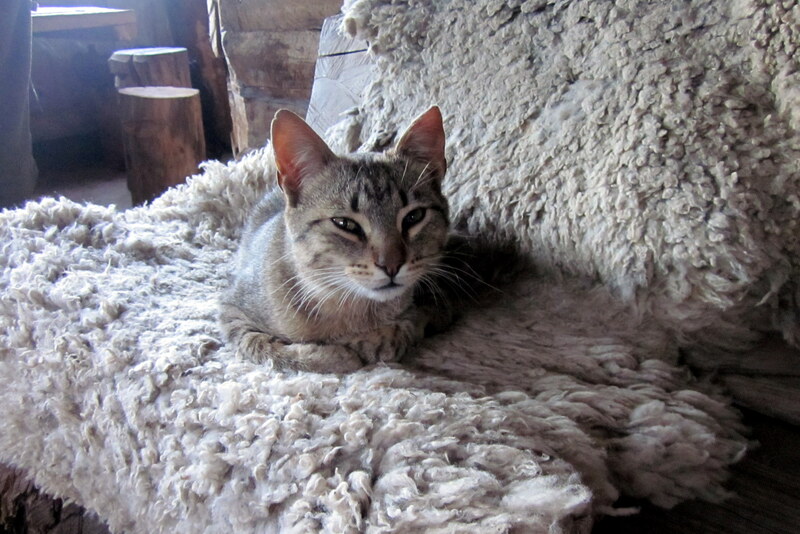 This cat was very scrawny and we felt a little bad for it. Naturally, animals in poorer countries are also not doing as well. People were feeding chicken bones and noodles to her, which we found rather disturbing. We gave her some attention. Diese Katze war sehr dürr und hat uns ein bisschen leid getan. Logischerweise geht es Tieren in ärmeren Ländern auch nicht so gut. Die Leute haben sie mit Hähnchenknochen und Nudeln gefüttert, was wir echt ätzend fanden. Wir haben ihr ein bisschen Aufmerksamkeit geschenkt. 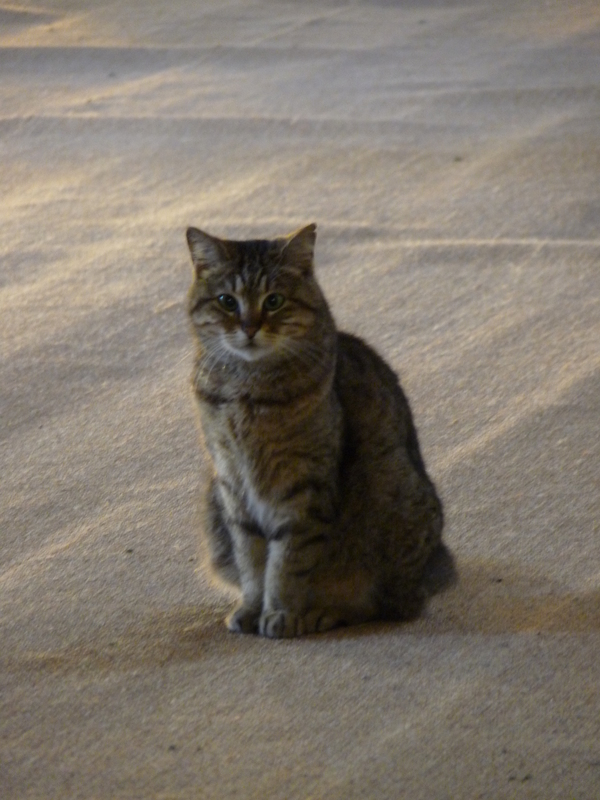 A majestic cat inside Hagia Sophia, one of the greatest structures on earth in Istanbul, Turkey. 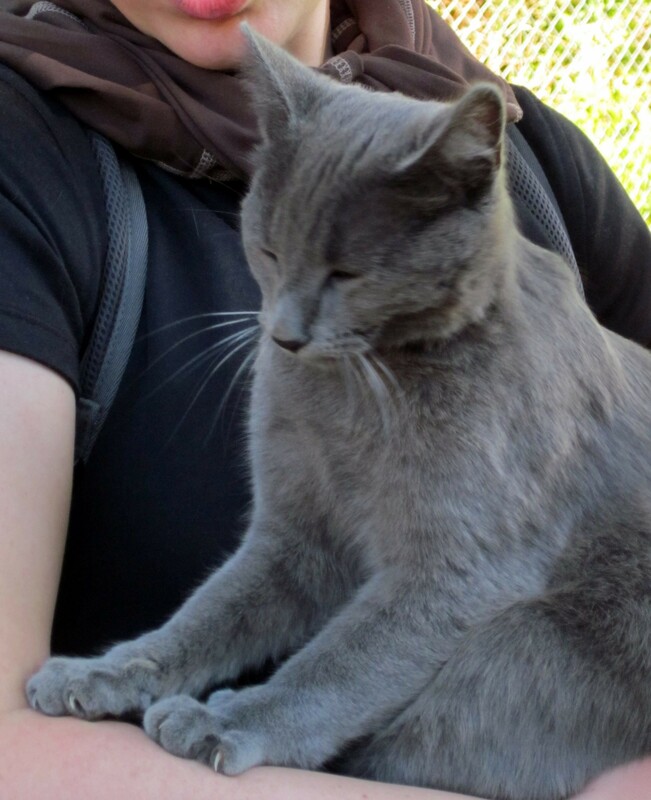 Eine majestätische Katze in der Hagia Sophia, eins der großartigsten Gebäude der Welt in Istanbul, Türkei. 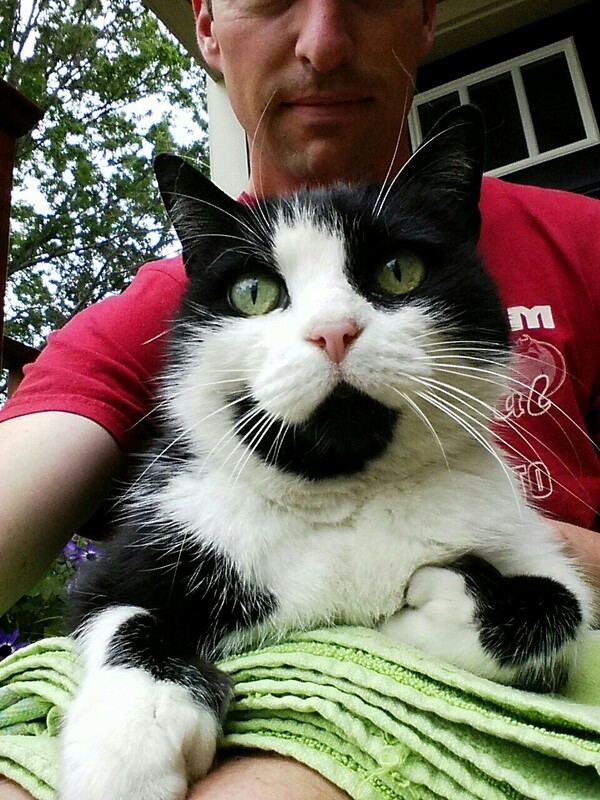 And at the end of each trip, taking selfies with our neighborhood cat is always the best. Und am Ende jeder Reise sind Selfies mit unserer Nachbarskatze immer noch am besten. 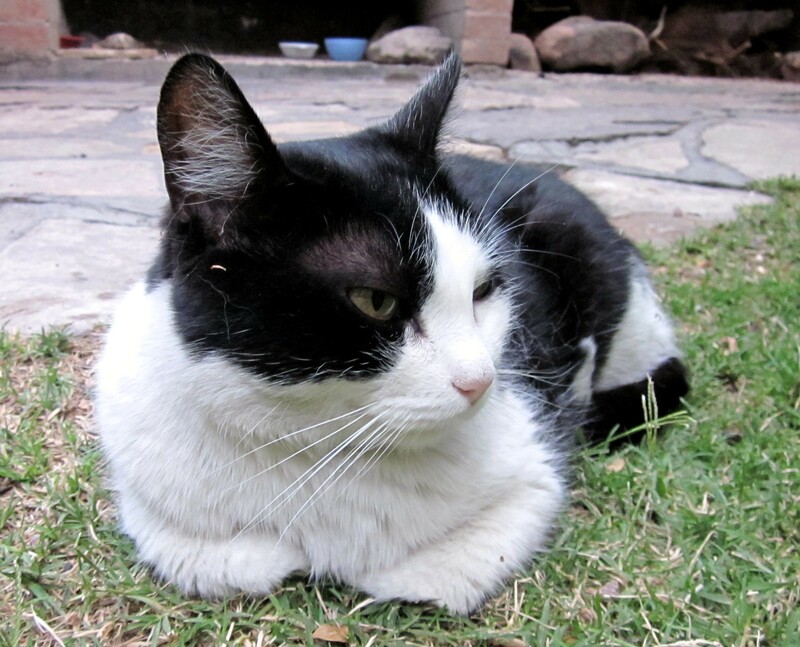 This entry was posted in Argentina, Mexico, Nostalgia Series, On the Road, Peru, Turkey, Uruguay, USA, USA - Massachusetts, Vietnam and tagged Cats, Traveling on July 3, 2015 by Eva. They’re all over the country, and you gotta love them: U.S. national parks. Matt and I have been to many, and I could spend the entire year traveling through them. 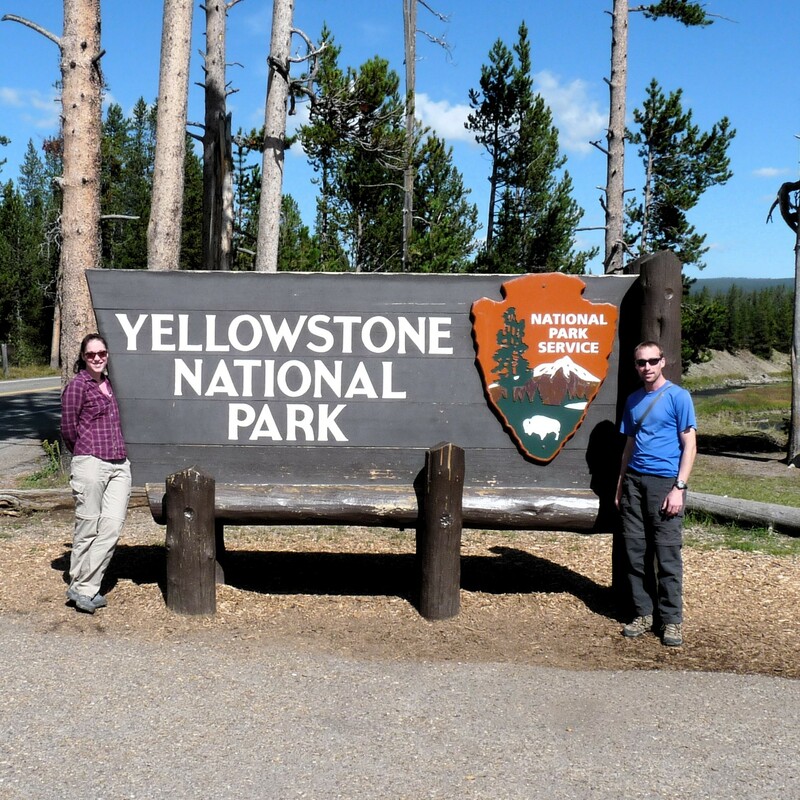 When we were in Wyoming in August, I learned that Yellowstone was actually the first national park. Established in 1872, there was no state government to manage it yet, so the federal government took over. It wasn’t until 1916 that the National Park Service (NPS) was founded as an agency to manage all national parks. I love the National Park Service. In my opinion, it’s one of the greatest things ever created in the United States. With the help of volunteers and park partners, the NPS is proud to safeguard more than 400 places and to share their stories with more than 275 million visitors every year. Unlike Argentina or Peru where foreigners are charged more, U.S. national parks have the same low fee for everyone. A place for all. And then there are the employees: 20,000 of them who work tirelessly and passionately to care for the nation’s special places. This year, I also discovered ranger programs. Every night at the campsite in Yellowstone, they had talks with different themes. We attended one about the history of wolves and another one about animals in the park. Completely free. And then last weekend with friends visiting from Germany, I went to those talks in Boston. 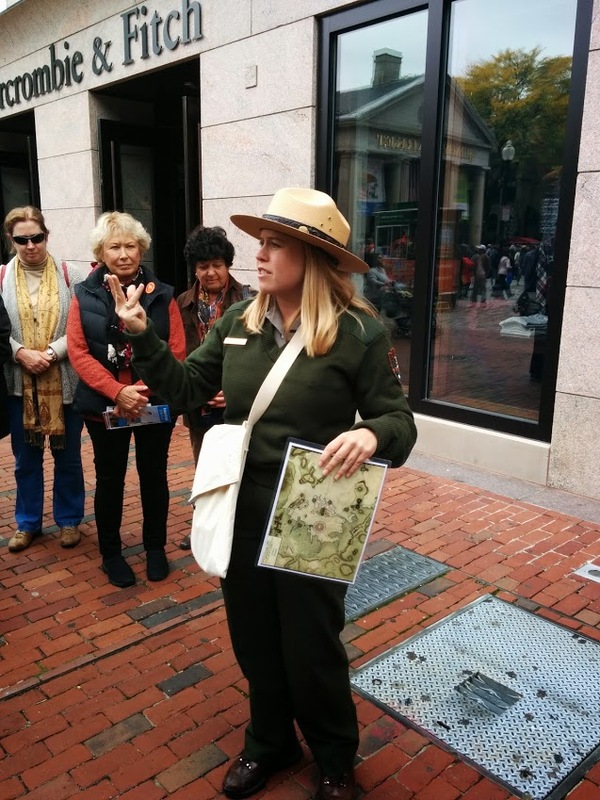 Boston is not really a national park but a national historical site protected under the NPS. 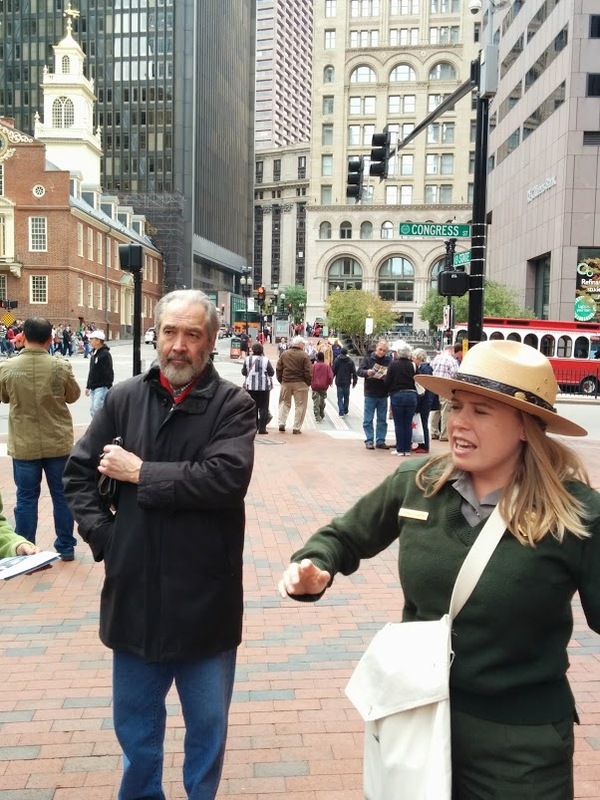 It took me 9 years to find out that I could attend a free ranger talk and learn about the history of Bunker Hill or walk the Freedom Trail with a ranger. I loved it. Coincidentally, we got the same ranger twice, and she did a phenomenal job. I’ll let the pictures speak for themselves. We finally had nice weather when we left Yellowstone and returned to Grand Teton National Park. Wir hatten endlich schönes Wetter, als wir Yellowstone verließen und wieder in den Grand Teton Nationalpark fuhren. Es gibt sie im ganzen Land und man muss sie einfach toll finden: amerikanische Nationalparks. Matt und ich waren schon in vielen und ich könnte mich das ganze Jahr dort aufhalten. Als wir im August in Wyoming waren, lernte ich, dass Yellowstone eigentlich der erste Nationalpark war. Bei der Gründung 1872 gab es keine Staatsregierung, die sich darum kümmerte, sodass die Bundesregierung ihn übernahm. Erst 1916 wurde der National Park Service (NPS) als Agentur gegründet, die sich um alle Nationalparks kümmern sollte. Ich liebe den National Park Service. Meiner Meinung nach ist er eins der großartigsten Dinge, die jemals in den USA geschaffen wurden. Mit Hilfe von Freiwilligen und Parkpartnern ist der NPS stolz darauf, mehr als 400 Orte zu schützen und deren Geschichten unter mehr als 275 Millionen Besuchern zu verbreiten. Im Gegensatz zu Argentinien und Peru, wo man als Ausländer mehr bezahlen muss, verlangen amerikanische Nationalparks die gleiche niedrige Gebühr von jedem. Ein Ort für alle. Und dann sind da noch die Angestellten: 20.000 gibt es davon und sie arbeiten unermüdlich und leidenschaftlich, um die besonderen Orte der Nation zu bewahren. Dieses Jahr habe ich außerdem die Rangerprogramme entdeckt. Jeden Abend auf dem Zeltplatz in Yellowstone gab es Vorträge mit verschiedenen Themen. Wir waren bei einem zum Thema Wölfen und bei einem anderen über Tiere im Park. Komplett kostenlos. Und dann letztes Wochenende, als wir Freunde aus Deutschland da hatten, gingen wir zu solchen Vorträgen in Boston. Bei Boston handelt es sich nicht wirklich um einen Nationalpark, aber um eine nationale historische Stätte, die unter dem Schutz des NPS steht. 9 Jahre hat es gedauert, bis ich begriffen habe, dass man bei einem kostenlosen Rangervortrag mitgehen kann, um etwas über die Geschichte von Bunker Hill zu erfahren oder den Freedom Trail mit einem Ranger abgehen kann. Ich fand das toll. Zufällig hatten wir den gleichen Ranger bzw. die gleiche Rangerin zweimal und sie hat das klasse gemacht. Ich lasse die Bilder für sich sprechen. Ranger Jessica in action. Quincy Market reflected at Abercrombie & Fitch. It was too busy and too loud to go in front of Faneuil Hall Columbus Day weekend. Rangerin Jessica in Aktion. Quincy Market spiegelt sich bei Abercrombie & Fitch. Es war am Columbus-Day-Wochenende zu viel los und zu laut, um sich vor Faneuil Hall zu stellen. Stop #2, the Old State House. They took off the lion and the unicorn on the left and right sides for restoration and found a time capsule in the lion. So cool. The contents of the time capsule will be displayed at the Old State House soon. I’m going! They are now taking ideas for a new time capsule. The only item accepted so far is a Boston Marathon 2013 medal. Stopp Nr. 2, das Old State House. Der Löwe und das Einhorn an der rechten und linken Seite werden zur Zeit restauriert und man hat in dem Löwen eine Zeitkapsel gefunden. So cool. Der Inhalt der Zeitkapsel wird bald im Old State House ausgestellt werden. Da geh ich hin! Es werden gerade auch Ideen für eine neue Zeitkapsel gesammelt. Der einzige Gegenstand, der bisher akzeptiert wurde, ist eine Medaille vom Boston Marathon 2013. This entry was posted in Argentina, Peru, USA, USA - Massachusetts, USA - Wyoming and tagged Boston, History, National Park Service, Nature, Traveling, Yellowstone National Park on October 15, 2014 by Eva. To wrap up my international food series, here’s my final post. I hope you enjoyed it so far. Obviously, there are a lot of different foods you could eat in Asia. From street foods to eating in restaurants, we quickly established the first rule of travel in Asia when we arrived: Be careful what you put in your mouth! If you cannot identify from a good safe distance what they’re cooking, just move on. We started our 7-week Southeast Asia loop in Thailand, then moved through the North to Laos, flew to Vietnam, traveled overland to Cambodia and back to Thailand before heading to Europe. As many Westerners probably have experienced themselves, we found Asian food back home to be much better tasting than on the road. I’m sure the locals would disagree. It is obviously modified according to our taste buds but I don’t think that’s a bad thing. We did enjoy the curries of Thailand quite a bit but that was about it. One great thing about food in the United States is the variety that’s offered. It’s a completely different ballgame when you travel long term. When you’re on vacation for two weeks, you naturally sample as much exotic fare as you can. By the time we got to Vietnam and were eating noodle soups for breakfast, dinner and lunch due to the lack of other options, we started craving dairy products like crazy. After all, we are creatures of habit, aren’t we? Zum Abschluss meiner internationalen Essensreihe kommt hier mein letzter Eintrag. Ich hoffe, euch hat das bisher gefallen. Offensichtlich kann man viele verschiedene Dinge in Asien essen. Vom Imbiss auf der Straße zu den Restaurants stellten wir sehr schnell nach unserer Ankunft die erste Regel für Asienreisen auf: Vorsicht ist geboten! Wenn man von einer sicheren Entfernung nicht erkennen kann, was gekocht wird, zieht man lieber weiter. Unsere siebenwöchige Rundreise durch Südostasien begann in Thailand, ging durch den Norden nach Laos, weiter mit dem Flugzeug nach Vietnam, dann über Land nach Kambodscha und zurück nach Thailand, bevor es nach Europa ging. Wie viele Westliche das bisher vielleicht auch gemerkt haben, fanden wir, dass asiatisches Essen zu Hause besser schmeckt als unterwegs. Ich bin mir sicher, dass die Einheimischen nicht so denken. Natürlich ist das unserem Geschmack angepasst, aber das muss nicht unbedingt schlecht sein. Thailändische Currys waren sehr gut, aber das war’s dann auch schon. Etwas ganz Tolles am Essen in den USA ist die Vielfältigkeit. Es ist was ganz anderes, wenn man länger unterwegs ist. Wenn man nur zwei Wochen im Urlaub ist, dann probiert man so viel Exotisches aus, wie nur geht. Bis wir nach Vietnam kamen und Nudelsuppen zum Frühstück, zu Mittag und zu Abend aßen, weil es sonst nichts anderes gab, bekamen wir totale Gelüste auf Milchprodukte. Der Mensch ist halt ein Gewohnheitstier, oder? Quietly located at Sam Sen Road and the Phadung Krung Kasem canal in Bangkok and far enough from the overpriced Khaosan Road, this place was curry heaven for as little as $3. And if you’re lucky, you might also spot a monitor lizard. Ganz ruhig an der Sam Sen Straße und dem Kanal Phadung Krung Kasem in Bangkok gelegen und weit genug von der überteuerten Khaosan Straße war dieses Restaurant für nur 3 $ ein Curryparadies. Und wenn man Glück hat, sieht man vielleicht sogar einen Waranen. 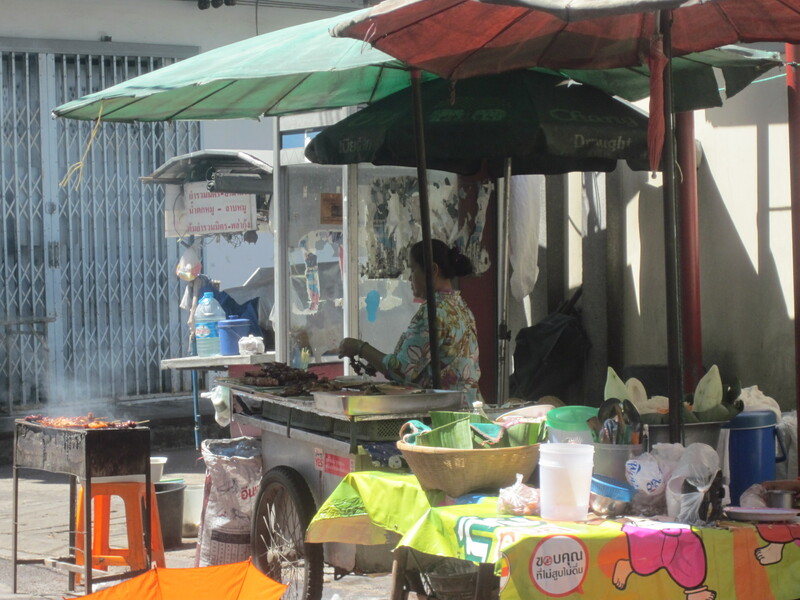 Street food in Bangkok. We tried pad thai once but were disappointed. If you wanted to, you could also eat grilled insects. Not for us. After a while, we just stuck to curries, a safe bet. 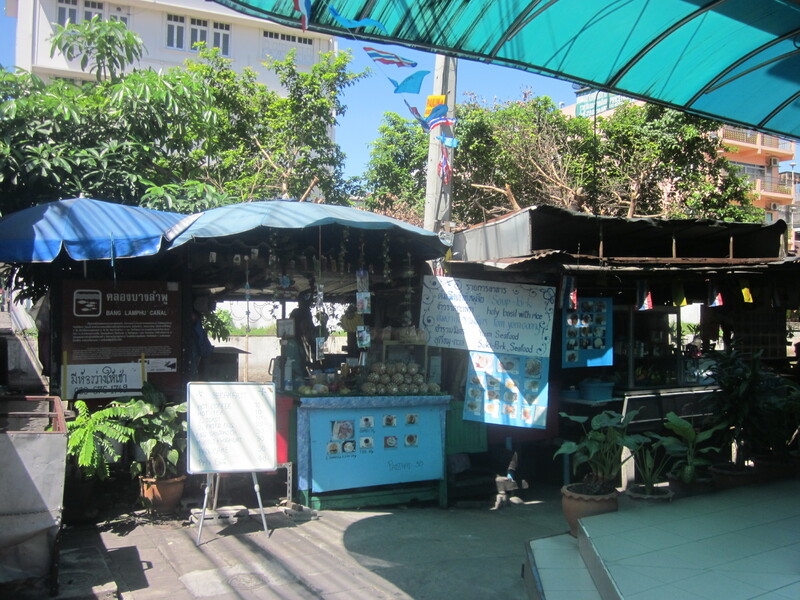 Straßenimbiss in Bangkok. Wir probierten auch Pad Thai aus, waren aber enttäuscht. Wenn man wollte, konnte man auch gegrillte Insekten essen. Nichts für uns. Nach einer Weile gab es nur noch Currys für uns. Da konnte man nichts falsch machen. Outside of Europe and parts of South America like Argentina and Chile, just forget about drinking wine. It’s either too expensive or just not available. We still wanted our occasional beer. In most parts of the world, that just means plain old watery pilsener. I like my wheat beer and Matt his IPA but you stick to what’s around. 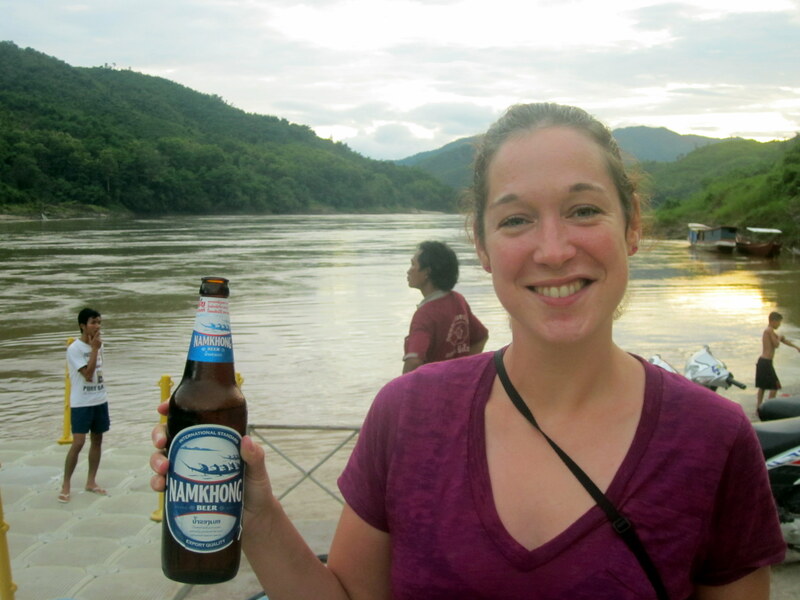 Namkhong was one of the better tasting beers in Laos during our Mekong river tour from Thailand to Laos. Cheers! Außerhalb von Europa und in Teilen Südamerikas wie Argentinien und Chile sollte man Wein lieber vergessen. Er ist entweder zu teuer oder es gibt nichts. Wir wollten trotzdem ab und an ein Bierchen trinken. In den meisten Teilen der Welt bedeutet das einfach wässriges Pils. Ich mag mein Weizenbier und Matt sein IPA, aber man trinkt halt, was da ist. Namkhong war eins der besser schmeckenden Biere in Laos während unserer Reise auf dem Mekong-Fluss von Thailand nach Laos. Prost! 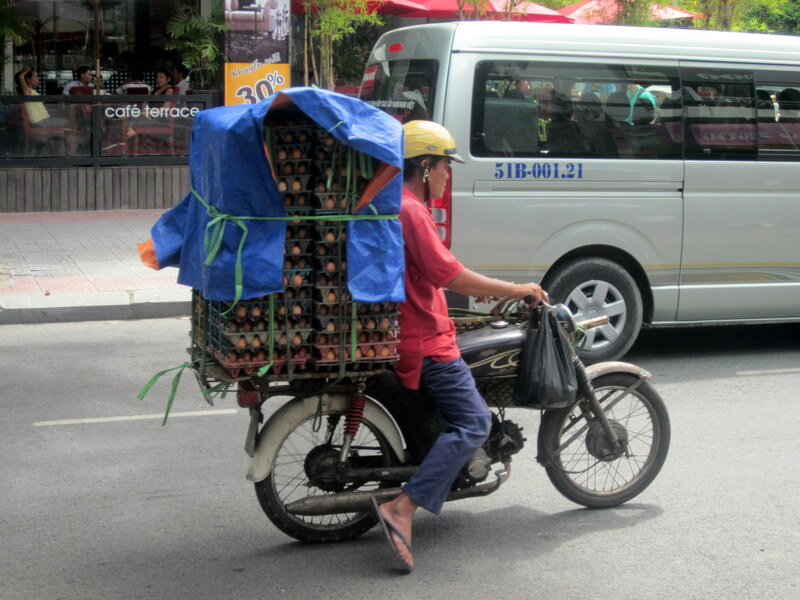 The Vietnamese transport everything on their motorcycles, including their entire families. Need eggs? Die Vietnamesen transportieren alles auf ihren Motorrollern, einschließlich der ganzen Familie. Eier gefällig? 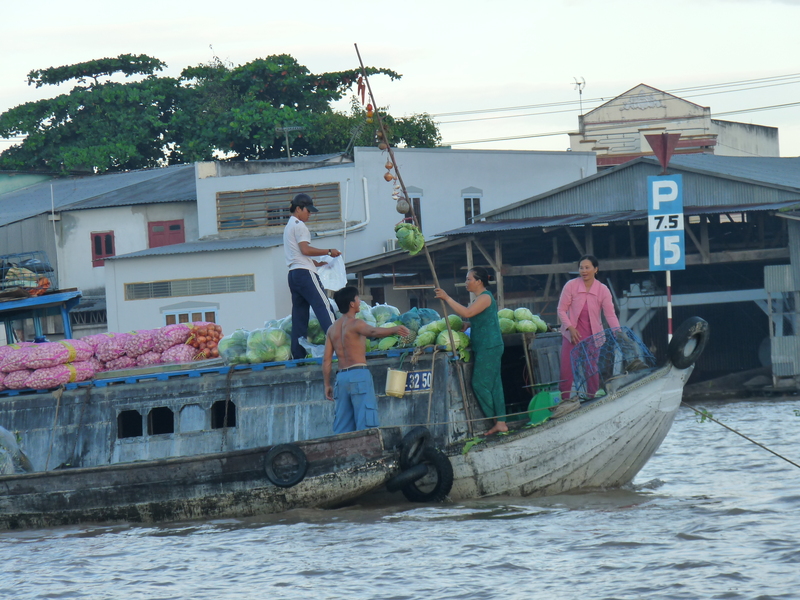 Early food market in the Mekong Delta in Southern Vietnam. Most of the activities are done by 7:00 am. On the long stick, you can see what’s for sale today. Früher Essensmarkt im Mekong-Delta in Südvietnam. Die meisten Aktivitäten sind bis 7:00 Uhr vorbei. Auf der langen Stange sieht man, was heute angeboten wird. We didn’t take any food pictures in Cambodia. 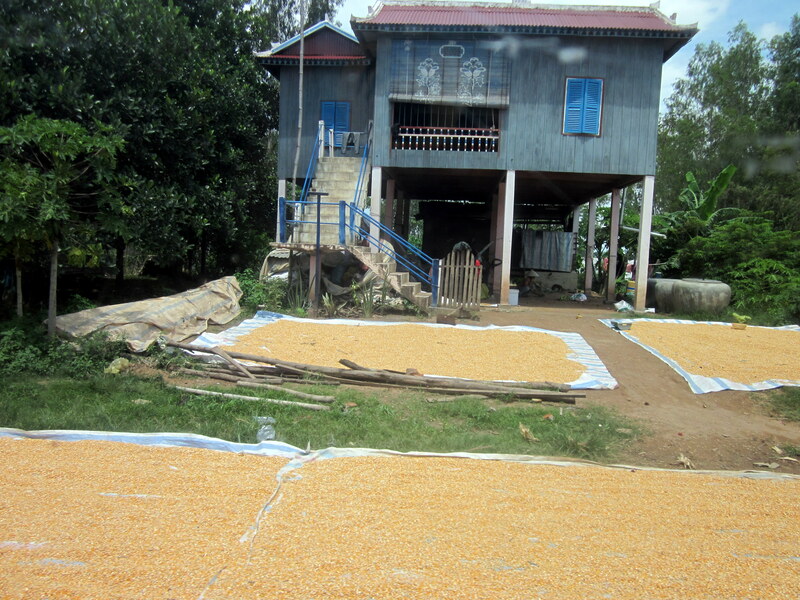 However, one thing we noticed when we arrived was the huge amount of corn drying in the sun on the side of the road. Wir haben in Kambodscha keine Fotos vom Essen gemacht. Allerdings fiel uns bei der Einreise auf, dass sehr viel Mais an der Straßenseite getrocknet wurde. This entry was posted in Argentina, Cambodia, Chile, Europe, Food, Laos, Thailand, USA, Vietnam on March 22, 2014 by Eva. Ever since I started training for the Boston Marathon, I’ve been SO hungry. 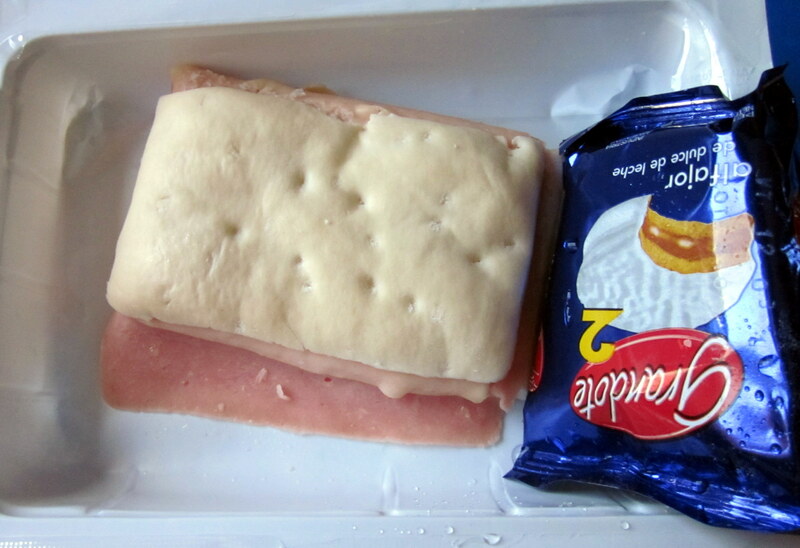 When we were traveling back in the days, we had to find food along the way every day. Sometimes, we were very hungry, too. Either because of not enough food or the choices available. 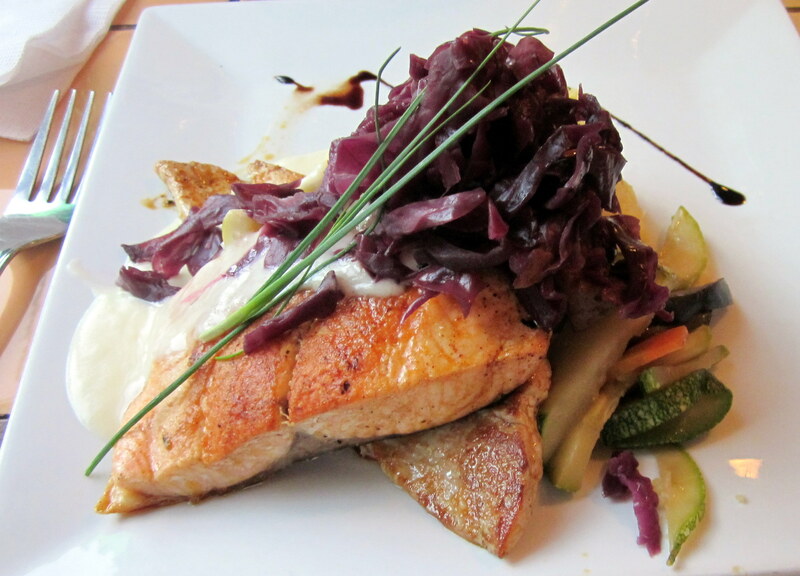 I sifted through our travel pictures and decided to post some of our food adventures. Here’s part one: Argentina & Chile. Seit ich mit dem Training für den Boston Marathon begonnen habe, habe ich ständig Hunger. Als wir damals unterwegs waren, mussten wir jeden Tag sehen, wo wir unser Essen her bekamen. Manchmal hatten wir auch sehr viel Hunger. Entweder, weil es nicht genug gab oder wegen der Auswahl, DIE es gab. Ich hab mal ein bisschen durch unsere Reisefotos geschaut und mir gedacht, dass ich mal ein paar Fotos von unseren Essensabenteuern hier reinstelle. Hier ist Teil 1: Argentinien und Chile. 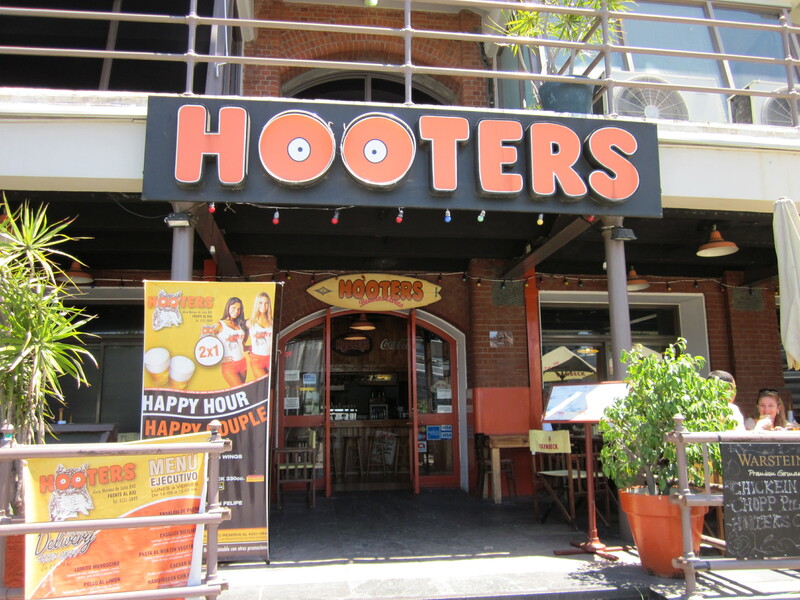 Hooters restaurant in Buenos Aires, Argentina. No thanks. Hooters-Restaurant in Buenos Aires, Argentinien. Nein danke. 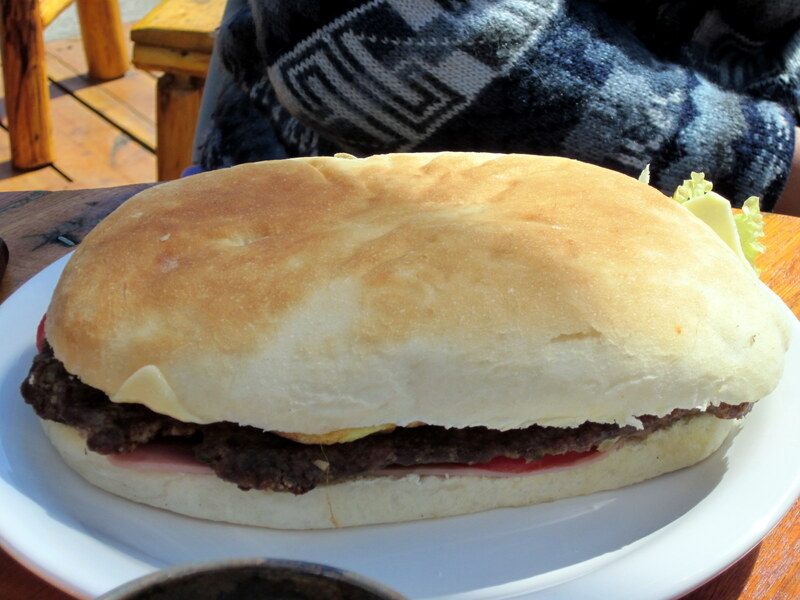 Hamburger in El Bolsón. Hell yeah! Meal on our 2-day bus ride through Patagonia. Not good. Mahlzeit auf unserer zweitägigen Busfahrt durch Patagonien. Nicht gut. Not sure what that was. And it wasn’t very good, either. Iquique, North Chile. Nicht sicher, was das war. Und gut war es jedenfalls nicht. Iquique, Nordchile. 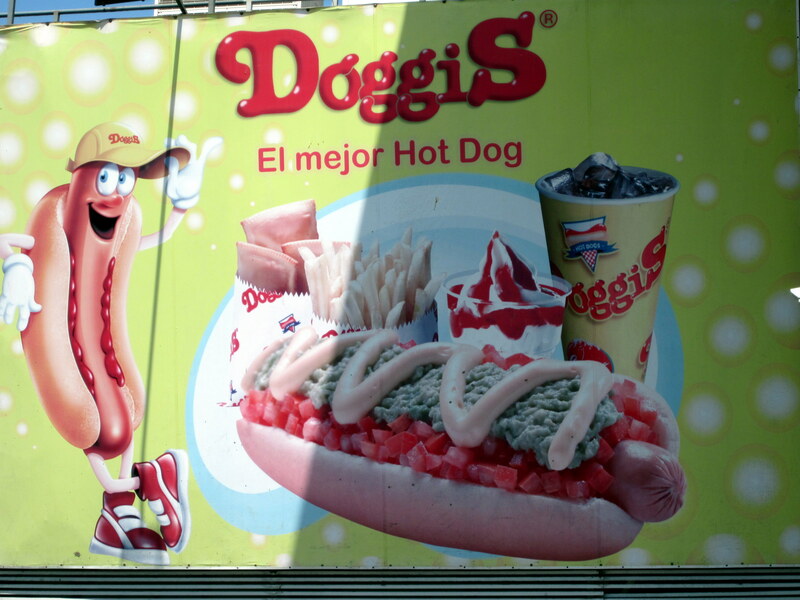 Apparently, you can also get hot dogs there. Hot Dogs kriegt man da anscheinend auch. Valparaíso, Chile. Some of the best food we had. Unter anderem das beste Essen, was es gab. 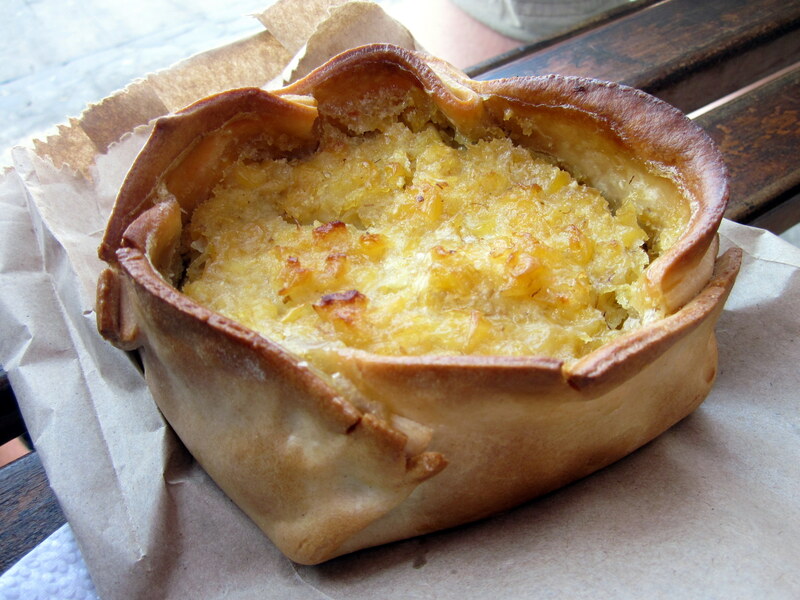 This entry was posted in Argentina, Chile, Food, Vietnam on March 9, 2014 by Eva. Here we are. Another travel year gone by. 2012 was full of travel stories around the U.S. and Canada, but I also reflected on that big trip we embarked on in 2010. Was it really that long ago? To our loyal readers, thank you for following, and may the new year bring lots of wonderful stories to share. Which brings me to our New Year’s celebration in Mendoza, Argentina in 2010. Expecting the city to be full of parties we set out for a fun-packed bar around 9:00 pm only to find the streets deserted. What was going on? We ended up having a beer at a small kiosk and I asked the owner where the people were. He told me that everyone was at home celebrating and that they would start going to the bars around 1:00 am. Seriously? We drowned our sorrows with some cheap beer and then headed back to the hostel to watch 2011 arrive on TV. What a bummer. Out of all places, I expected Argentina to offer us a party we would never forget. Well, that’s what kind of happened. There was a private party at the hostel and people were kind enough to include us. But it was still the most awkward New Year’s celebration I had ever experienced. When in Rome, do as the Romans do… Merry Christmas and a Happy New Year! Stranded at a kiosk. Where the hell are all the people? Hier sind wir. Ein weiteres Reisejahr ist vorbei. 2012 gab es viele Reiseberichte aus den USA und Kanada, aber ich hatte auch Zeit, über die lange Reise nachzudenken, die 2010 begann. Ist das wirklich schon so lange her? An unsere treuen Leser, danke fürs Mitlesen und hoffen wir auf viele wunderschöne Geschichten im neuen Jahr. Was mich zu unserer Silvesterparty 2010 in Mendoza, Argentinien bringt. Wir hatten eine Stadt voller Partys erwartet und machten uns gegen 21:00 Uhr auf, eine lustige Bar zu finden. Aber die Straßen waren menschenleer. Was war denn da los? Wir landeten für ein kleines Bier bei einem kleinen Kiosk und ich fragte den Besitzer, wo denn die Leute seien. Er sagte mir, alle seien zu Hause am feiern und würden erst gegen 1:00 Uhr in die Bars gehen. Nee jetzt, oder? Wir ertränkten unseren Frust also mit billigem Bier und gingen dann zurück ins Hostel, um 2011 am Fernseher zu begrüßen. Schrecklich. Von allen Orten dachte ich, dass wir in Argentinien eine unvergessliche Party feiern würden. Na gut, genau so war es eigentlich. Im Hostel wurde eine private Party gefeiert und die Leute nahmen uns netterweise auf. Aber es war trotzdem das komischste Silvester, das ich jemals erlebt hatte. Andere Länder, andere Sitten. Frohe Weihnachten und einen guten Rutsch! This entry was posted in Argentina, Canada, USA on December 25, 2012 by Eva.